Las Vegas shooter Stephen Paddock had a serious gambling machine addiction. Read the latest New York Times story on his gambling behavior. Electronic gambling machines were at the center of his life. Yet news coverage continues to use terms like “professional gambler” when describing Paddock. He was not a professional gambler. No professional gambler uses slot machines and video poker machines like Paddock did. 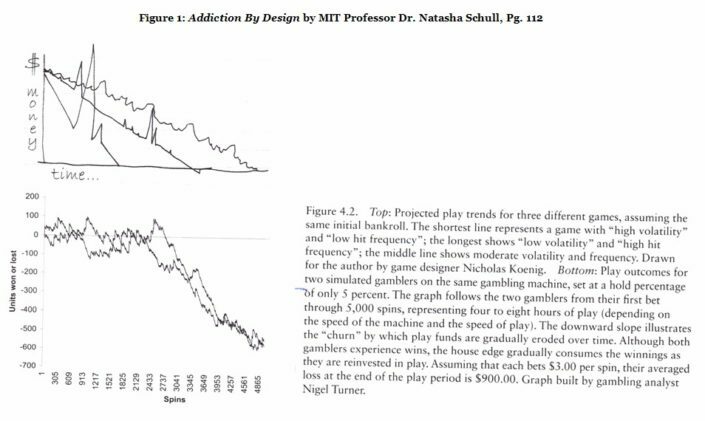 The machines create the allusion of skill but a user is mathematically guaranteed to lose all their money the longer they play them. Once you press the button on the machine, there is no skill involved. The computer inside the machine (known as the Random Number Generator) decides whether you lose or win. The player has no control over the outcome. The business model of casinos is based on people like Paddock losing over and over again. While he may have won occasionally, it’s a statistical certainty that he lost huge sums of money the longer and more frequently he played as the graph above shows. Paddock was playing hundreds of hands per hour (about one hand every six seconds) for many hours straight. Almost day after day. No credible gambling addiction expert unaffiliated with gambling operators and independently-funded would describe him as a “responsible gambler.” ‘Responsible gambling’ is little more than a marketing slogan made up by commercialized gambling operators and their partners. Its intent is to place the spotlight on the citizen and away from their predatory and fraudulent business practices. Whether Paddock’s out-of-control addiction to electronic gambling machines was a central factor in what happened last Sunday will be determined by the FBI investigation. But news coverage and public discussion should not normalize Paddock’s single-minded obsession with gambling machines and the exploitive business practices used by the casinos to keep Paddock gambling continuously. Improving the lives of the American people, using education and advocacy to free us of the lower standard of living, exploitation and dishonesty that commercialized gambling spreads.